Oral health of children in England: a call to action! Dental caries in the deciduous dentition. Results of national dental epidemiology programme dental surveys of 5 year olds in 2015. 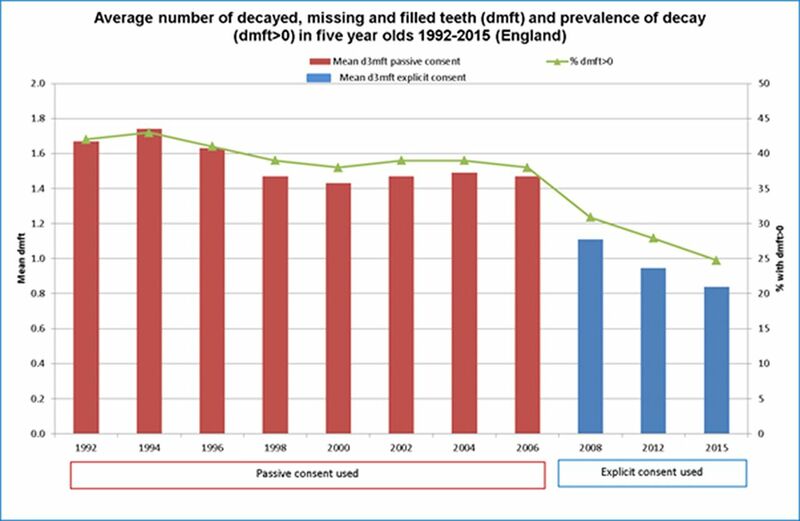 Average number of decayed, missing and filled teeth (dmft) among 5 year olds in England by region 2015. Stark inequalities exist with some of the most vulnerable, disadvantaged and socially excluded facing significant oral health problems. Almost 41% of this variation can be explained by material deprivation (figure 4) with regard to the most recent data for 5 year olds,6 while inequalities were also found according to ethnicity with 51% of Chinese 5 year olds having obvious decay, followed by 48% of Eastern European with the remaining groups, ranging from 45% to 21% (figure 5). 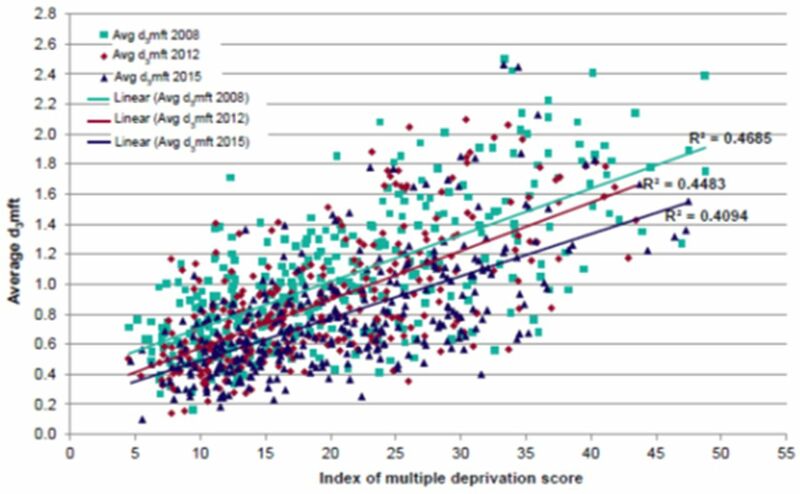 Correlation between numbers of decayed, missing and filled teeth (dmft) and index of multiple deprivation score for lower tier local authorities in England (2008, 2012 and 2015). Results of national dental epidemiology programme dental surveys of 5 year olds in 2015. 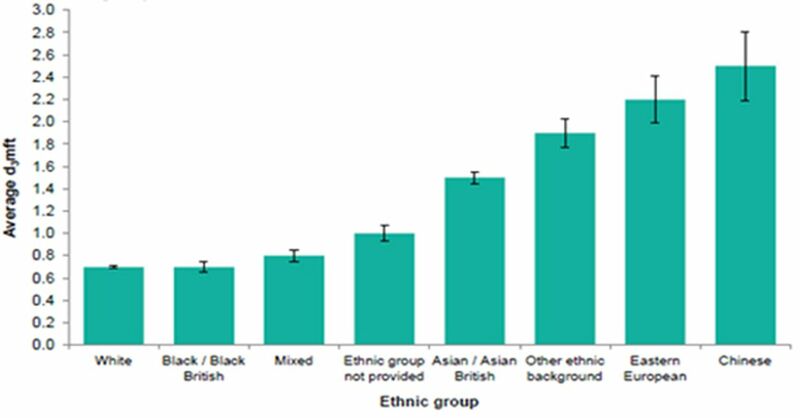 Average number of decayed, missing and filled teeth (dmft) among 5 year olds in England by ethnic group 2015. What can we do to improve oral health and address oral health inequalities? What works at an individual patient level? Start brushing as soon as the first tooth appears (usually at about 6 months of age), at least twice a day with fluoride toothpaste last thing at night and on at least one other occasion. Brushing at bedtime is important as it makes sure that the fluoride continues to protect the teeth while your child is asleep. Parents/carers should brush or help their child to brush their teeth until they are at least 7 years old to make sure the teeth are cleaned properly, to supervise the amount of toothpaste used and to prevent licking or eating the toothpaste. For the maximum prevention of dental caries for children aged 0–6 years, use toothpastes containing 1350–1500 parts per million fluoride. 0–3 year olds use a smear and for 3–6 year olds a pea-sized amount (see figure 7). Reduce the amount and frequency of having foods and drinks that contain sugar; only give sweet foods including dried fruit at meal times. Squashes sweetened with sugar, fizzy drinks, soft drinks and juice drinks have no place in a child’s daily diet. Limit the amount of fruit juice and/or smoothies your child drinks to a maximum of 150 ml (one portion) in total per day and drink it with meals to reduce the risk of dental caries. Always ask for sugar-free medicines. Breast milk is the only food or drink babies need for around the first 6 months of their life. Formula milk is the only suitable alternative to breast milk. From the age of 6 months, bottle-fed babies should be introduced to drinking from a free-flow cup. Bottle feeding should be discouraged from 12 months old. Only breast or formula milk or cooled, boiled water should be given in bottles. Only milk or water should be drunk between meals and avoid adding sugar to foods or drinks for your baby. Take your child to see the dentist as soon as their teeth start to appear and visit regularly, as often as your dentist recommends. Ask your dentist about fluoride varnish—all children over 3 years should have this applied to their teeth. 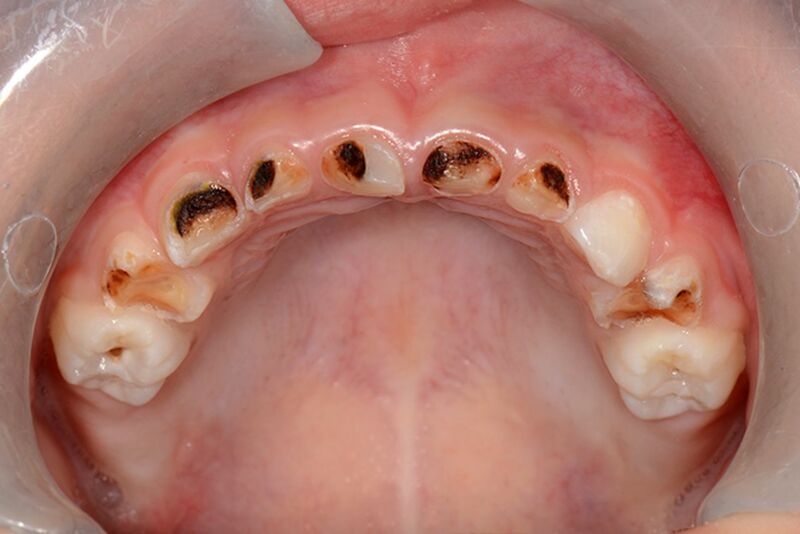 If younger children are at particular risk of dental caries, the dentist may apply to their teeth. National Health Service dental treatment is free for children under 18 or under 19 and in qualifying full-time education. Women are entitled to free National Health Service dental treatment during pregnancy and any treatment commenced before their child’s first birthday. The National Institute for Health and Care Excellence (NICE) in their recent guidance ‘Oral Health Promotion: General Dental Practice’14 supports the messages within DBOH and describes how dental practice teams can give such advice to support behaviour change. Influencing local and national government policies. In England, The Health and Social Care Act (2012) conferred statutory responsibilities17 on local authorities to provide or commission oral health programmes to meet the needs of their local population and duties and powers with regard to water fluoridation.18 In the devolved nations, a national approach has been adopted, with programmes such as ‘Childsmile’ in Scotland19 20 and ‘Designed to Smile’ in Wales21 commissioned to address poor oral health. Learning from these successful approaches has resulted in many of the elements of these programmes being currently commissioned by local authorities in England, who have the statutory responsibility for oral health improvement.22 However, it is clear that if we are to succeed, action to reduce the consumption of free sugars and increase access to fluoride is required across the health and social care system. Oral health improvement needs to be everyone’s business. In September 2016, PHE launched the Children’s Oral Health Improvement Programme Board to develop partnerships and mutual support and coordinate action across the system. Board members represent organisations across the health, education, voluntary and community sector with the shared ambition that ‘every child should grow up free from tooth decay’ as part of getting the best start in life. In order to achieve this ambition, the board partners aim to improve the oral health of all children and reduce the oral health gap for disadvantaged children. The Board has a cross-organisational action plan that outlines five high-level objectives, with examples of how they will be delivered and what success will look like in 2020.23 Since the Board’s launch, partners have delivered or are on track to deliver commitments including publishing tools and resources to support delivery of the ambition. National and local government policy have a key role to play, and the recent government action to address childhood obesity will also impact on oral health as both share the common risk factor—consumption of free sugars. In 2015, the Scientific Advisory Committee on Nutrition (SACN)24 recommended that the intake of free sugars should not exceed 5% of total daily energy intake for all age groups. SACN concluded that increasing the proportion of calories consumed as sugar increases the likelihood of a higher overall energy intake, thereby increasing the risk of weight gain and dental caries. PHE’s report Sugar reduction: the evidence for action 25 was published in October 2015. It considered the evidence on various drivers of sugar intake and based on the analyses conducted identified eight areas of action that, if implemented together, could change consumption patterns. Two of these have already been taken forward; reformulation of a monitored programme of gradual sugar reduction in everyday food and drink and the sugar levy. All sectors of the food industry will be challenged to reduce the overall sugar content of all food products consumed by children by around 20% over the next 4 years (by 2020), including an initial 5% reduction in the first year (by August 2017). The initial focus will be on those products that contribute most to children’s sugar intakes, which are captured within the following categories: breakfast cereals, chocolate confectionery, sweet confectionery, yoghourt and fromage frais, ice cream, sweet spreads and sauces, cakes, morning goods (eg, pastries, croissants, etc), puddings and biscuits. The government announced in the budget statement that companies making soft drinks should pay a levy on drinks with added sugar starting from April 2018. The levy will apply to any drink with total sugar content exceeding 5 g per 100 mL and the levy will increase for drinks with 8 g or more per 100 mL. The levy will be legislated in the Finance Bill in 2017. The development of healthy settings and healthy food policies are oral health promoting. Many targeted early-years settings are running daily supervised tooth brushing with fluoride toothpaste and/or fluoride varnish programmes, which have good evidence of reducing dental caries in 5 year olds. In addition, local authorities include oral health in their commissioning of services for 0–19 year olds. Oral health has been included in the delivery of the Healthy Child Programme (HCP) at the mandated contact points and especially around the time when the first tooth (6 months of age) erupts to encourage the commencement of tooth brushing twice a day with a smear of family toothpaste. The e-learning resource supporting the delivery of oral health within HCP has just been updated in collaboration with the Royal College of Paediatrics and Child Health and is freely available: http://www.rcpch.ac.uk/e-learning. As local authorities come under increasing financial pressure, information regarding the cost effectiveness of oral health improvement programmes becomes essential to inform business plans and the case for investment. 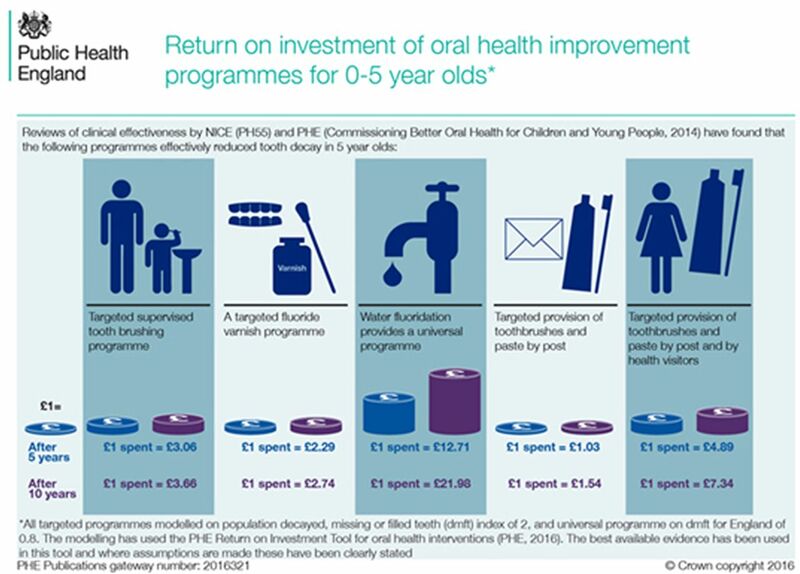 A rapid review of the evidence of the cost-effectiveness of interventions to improve the oral health of 5 year olds29 and a bespoke return on investment (ROI) tool were commissioned from the York Health Economics Consortium.30 This provided an update to the economic evidence review on oral health prevention measures published by NICE in 2014.31 32 It specifically examined the cost-effectiveness of those oral health interventions with good evidence of effectiveness in reducing the average number of decayed, missing and filled teeth in 5 year olds. This is the indicator that is included in both the NHS33 and Public Health Outcomes frameworks.34 The interventions included were supervised tooth brushing, application of fluoride varnish, water fluoridation, provision of toothbrushes and paste and interventions provided in home visits by health workers. The review concluded that they found few studies that added to the cost-effectiveness evidence base established by NICE15 for these interventions that were generalisable to England. However, the ROI tool allows the effectiveness data to estimate the reduction in dental caries as a result of the intervention, the costs of delivering each of the programmes and the cost savings. These savings areto the NHS, (which includes treatment costs in primary and secondary care), and to wider society (which is estimated for the child and parent/carer as days lost at school and work). Using modelling data, the ROI tool has been used to calculate the ROI of these five oral health improvement programmes at 5 and 10 years (figure 6). Infographic modelling the return on investment of oral health programmes. PHE, Public Health England (2016). llustration of a smear (for 0–3 year olds) and pea-size (for 3–6 year olds) amount of toothpaste. Paediatricians and the wider healthcare and early-years workforce have key roles in making every contact count: having the knowledge of the key evidence-based messages to support families to take action for oral health improvement13and the skills to support behaviour change and, when needed, signposting to local dental services if dental treatment or further support is required. Paediatricians have a key role as advocates for oral health improvement, at an individual patient level and in their wider work influencing the system to adopt oral-health-promoting initiatives, for example, healthy eating policies, supporting healthy settings and wider population programmes that work. We can all share the ambition that every child should grow up free from tooth decay, dental caries is preventable, we know what works and we can demonstrate improvement. Health and Social Care Information Centre. Hospital Episode Statistics, Admitted Patient Care,2013–14. 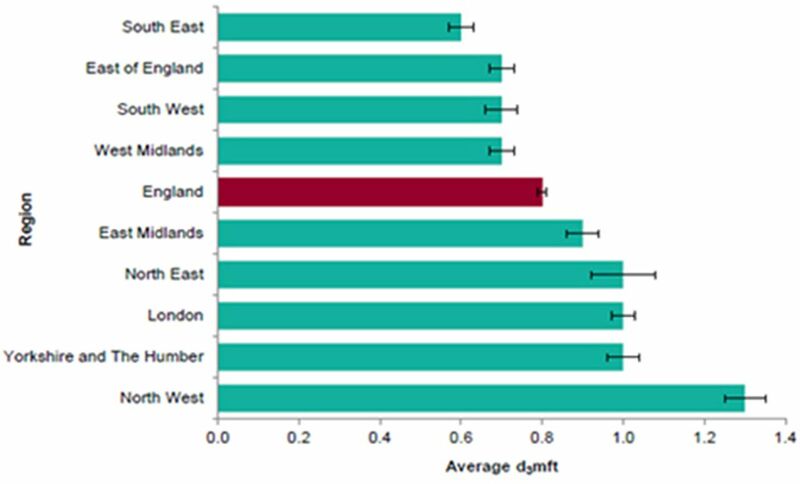 England, 2015. http://content.digital.nhs.uk/catalogue/PUB16719/hosp-epis-stat-admi-diag-2013-14-tab.xlsx (accessed 06 Feb 2017).
. Impact of oral health. Children’s dental health in the United Kingdom 2003. London: The Stationery Office, 2004. NHS England. Improving dental care and oral Health - a call for action, 2014. PublicHealth England 2017. Dental Public Health Intelligence Programme. http://www.nwph.net/dentalhealth/ (accessed 31 Aug 2017). Public Health England. National Dental Epidemiology Programme for England: oral health survey of three-year-old children 2013, 2013. http://www.nwph.net/dentalhealth/reports/DPHEP_for_England_OH_Survey_3yr_2013_Report.pdf (accessed 30 Aug 2017).
. Oral Microbiology. 4th edn. Oxford: Wright, 1999. Logislation.gov.uk. Health and Social Care Act, 2012. Gov.UK. Water Fluoridation (Proposals and Consultation) (England) Regulations 2013: impact assessment. Department of Health, 2013. NHS Bodies and Local Authorities: Partnership Arrangements, Care Trusts,Public Health and Local Healthwatch, in Regulations Statutory Instrument SI3094, 2012. Public Health England. Children’s Oral Health Improvement Programme Board Action Plan 2016- 2020, 2016. Public Health England. Sugar reduction: from evidence into action. 2015 https://www.gov.uk/government/publications/sugar-reduction-from-evidence-into-action (accessed 27 Mar 2017). Contributors All authors have equally contributed to this manuscript.